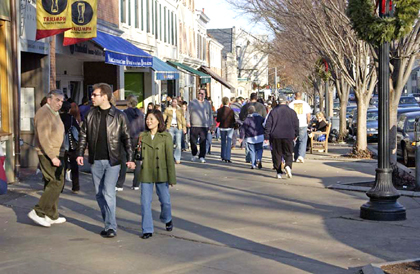 SPRING IN JANUARY: Strollers on Nassau Street enjoy some fine weather on the first day of the new year. Saturday's temperatures hovered near the sixty degree mark. Looking ahead to set goals for a year that promises to bring a substantive change in Princeton Township and the Princeton community as a whole, Township Committee held their annual re-organization meeting Sunday. Forming a stronger bond with Borough merchants and Princeton University, finding a solution to the volatile tax rate that may increase significantly again in 2005, and finding a way to maintain affordable housing in the Borough for the long-run, were the main issues discussed by Borough Mayor Joe O'Neill at the Borough's reorganization meeting on Sunday. After several discussions between residents, Township Committee, and the Princeton Regional School Board, Township Police have begun enforcing a new law prohibiting eastbound drivers from passing on the right near the entrance of Johnson Park School.